Welcome home to 409 Ballard Road! Peaceful country living so close to the city. 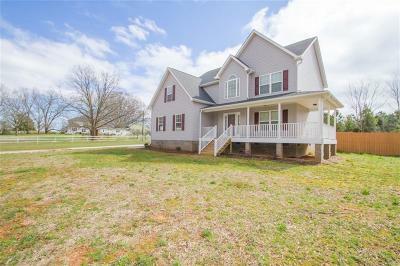 Located between Anderson and Greenville; just a few minutes off of I-85, sits this ONE year old, MOVE-IN ready 4 BR 2.5 BA home on 1.25 acres. Step into the 2-story foyer and off of the charming rocking chair front porch. Take a moment to admire the great OPEN floor plan and its FUNCTIONAL glamour. As you enter the home you will notice, to your right, the large sunlit formal dining room. You are picturing Easter dinner here arenât you? Your new kitchen is in the next room and is open to the large living room with gas log fireplace. The kitchen features (1) a large peninsula island, (2) tons of cabinet and countertop space, (3) stainless steal appliances, and (4) a breakfast room with access to the fenced-in backyard. Also on the main level, just off of the attached garage, will find a 1/2 bath. Whether your days are calm and peaceful or wild and hectic this space will be able to handle you and your family. Be prepared to fall in-love with the master suites privacy, walk-in closet, and on-suite bathroom with double sinks, large garden tub and separate shower. There are three other guest bedrooms, with large closets, and guest bathroom located on the second level. Walk out the back door and take in the large fenced backyard. Any ideas where your grill is going? Like to garden, want a few chickens or a place for the dogs to run? Then this is the home for you! Excellent Anderson District 1 Schools. Possible USDA Financing. Driveway and sidewalk to be completed.